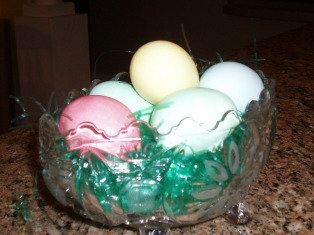 If you are just learning how to make Easter egg dye to color Easter eggs, you will have to know how to boil eggs first. The following directions will give you hard boiled eggs that are easy to peel. BOILING EGGS: Have eggs at room temperature. Bring a large kettle of water to boiling. Carefully put the eggs in the water with a large spoon. Reduce heat to medium and simmer eggs for 15 minutes. Set pan in sink and carefully dump out hot water but not the eggs. Immediately dump lots of ice over the eggs to cool them quickly. This process will make the eggs easy to peel. Coloring Easter eggs is a tradition in many countries; some dating back to ancient times. If you are want to learn how to make an egg dye recipe it can be as simple as dying with natural ingredients like fruits and vegetables to elaborately hand painted eggs. These techniques vary from country to country and even within the country; none are more beautiful than the Ukrainian Easter eggs. Throughout my life I learned how to make an Easter egg dye recipe simply by purchasing the easy commercially made type; usually liquid form made to add to water. Very quick and easy; just dip hard boiled eggs. For many years I had a favorite brand which left every egg different. The color was shiny and oily. You could put different colors in the same water. The eggs turned out beautiful and it was so easy; then they quit making this brand. I was so disappointed. Now many of us are trying to keep chemicals out of our home and especially out of our foods. This applies to our Easter egg dye recipe; this also means using natural dyes like fruits and vegetables. Bright colors are hard to come up with but with effort you can color some very pretty pastel colored eggs. 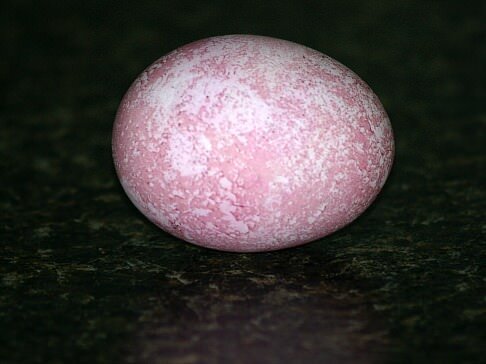 The longer the egg remains in the dye mixture the darker it will be. This year I tried making egg dye with my Wilton’s food color paste. If you want to learn how to make Easter egg dye like mine, here is how simple it is. Measure 1 cup of hot water into as many bowls as you want different colors. Stir in enough of the paste food coloring to reach the desired shade. Add 1 teaspoon of vinegar to each bowl. (Mixture should be cooled) First, I colored all of my boiled eggs as I wanted them; let the eggs in the bowls to reach desired shade. Pat the eggs dry and place in container. Next I added a little olive oil (maybe ½ to 1 tablespoon) to each bowl. Place an egg in one of the bowls depending on what color you want. I find starting with the lighter colors work best. Pat the egg dry and then place the same egg in another color. You get the idea? Simply experiment with different colors! Boil white eggs before you make Easter egg dye recipes; the white eggs always colors best. While still warm you can make designs on the eggs with crayons if you like. Where the wax from the crayons is applied no color will adhere from the dye. For a more smooth and uniform solid color on the eggs, strain the dye mixture with cheesecloth. Boil ingredients in water to reach desired colors. Let cool before adding eggs into the dye so as not to further cook the eggs. Use your imagination and experiment with other ingredients to come up with more colors. Mix your colors to make more colors. When I get started coloring Easter eggs, trying one Easter egg dye recipe after the other, I end up coloring more eggs than I thought I would. This leaves me with quite of lot of boiled eggs to use up. This is a great time to try out some of those recipes using hard boiled eggs like some of the Kentucky Derby recipes. To many people, especially residents in the area, the Kentucky Derby is the most exciting sports event in the whole year. This Bluegrass Region of Kentucky has always been known for its lush fields and the capability of producing superior racehorses. The Kentucky Derby is one of the oldest thoroughbred horse races. It is celebrated for a couple of weeks each spring and this includes many great Kentucky Derby recipes specifically created for this occasion. Many of the locals have picked up on these recipes and use them all year long. The following recipe is one that is frequently used for Easter Sunday breakfast in the Kentucky bluegrass area. Mix yolks with ham, 2 to 3 tablespoons heavy cream, salt and pepper. Scoop mixture back in egg whites and place in buttered casserole baking dish. Melt 2 tablespoons butter in saucepan over medium heat and stir in flour until smooth. Stir in scaled milk and scalded cream stirring until smooth. Season with salt and pepper and simmer 10 minutes; remove from heat. Sauté mushrooms in ¼ cup melted butter; add to creamed mixture and blend. Pour creamed mixture over eggs; top with Parmesan cheese and bake 8 to 10 minutes until golden. If you get carried away as I do using Easter egg dye recipes and end up with too many boiled eggs, try this French boiled egg recipe. Sauté onions in melted butter until softened not brown; add flour and stir to blend. Heat chicken stock and cream in saucepan; stir mixture into pan with onions and simmer 15 minutes. Add cheese, salt, pepper and nutmeg, stir until cheese is blended. Cut boiled eggs in quarters and stir gently into sauce; reheat over low. Pour mixture into buttered shallow flameproof dish or pan; brown surface under boiler. 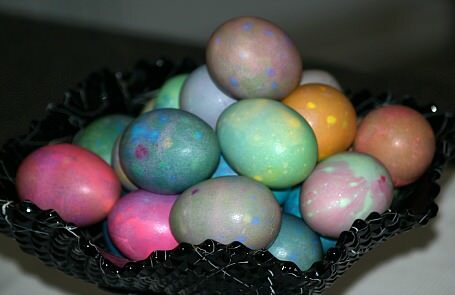 This is a great recipe to use the eggs that you color with Easter egg dye. 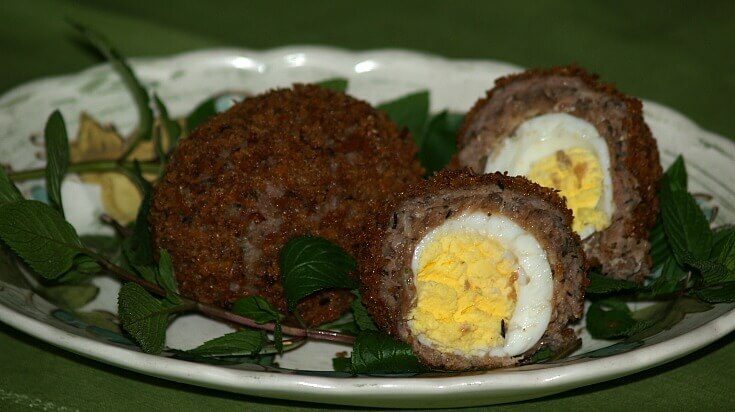 The origination of Scotch eggs is claimed by a department store in London back in the 1700’s. Although these eggs are known to be a common picnic food, I think they would make a “grand” appearance on an Easter buffet. Hard boil eggs, cool quickly with ice for better peeling and make Scotch eggs recipe. Combine and blend pork, salt, onions, cornstarch, sage, thyme and red wine; mash to very smooth consistency. Coat each shelled boiled egg with ¼ of sausage mixture encasing the egg evenly. Roll sausage coated eggs lightly in bread crumbs. Deep fry eggs in hot oil until golden brown; 5 to 10 minutes. To serve cut in half with a thin sharp knife and place on lettuce.